Transportation research is not an end unto itself. It’s a means by which the system we have can be transformed into the system we need. By proposing, testing and refining new ideas that improve and extend our transportation system, we make that system safer, help stretch dollars farther, and better serve the interests of the general public. No matter how useful research findings might be, though, getting them implemented is complicated. Technology evolves. Established procedures have to be rewritten, and practitioners must be educated on how to apply them. If a new policy impacts drivers directly, making them aware of what’s changed and sometimes garnering public support for it are necessary. Understanding the specific needs of a community is vital to applying research solutions effectively and efficiently at a statewide level. That’s why Texas A&M Transportation Institute (TTI) researchers work directly with urban and rural communities around Texas to put into practice our research findings. Nothing brings home the pain of living in a congested urban environment like sitting in the traffic jam yourself. Applying those solutions around the state — wherever they’re most needed — creates a stronger, more responsive transportation system for all Texans. 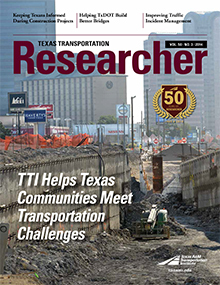 This issue of the Texas Transportation Researcher looks at how TTI research is helping communities around Texas and, in many cases, directly benefiting their economies. Stories in this issue show how we’re facilitating infrastructure improvements in Fort Worth, as well as cross-border trade in El Paso. A TTI-designed monitoring system operating along a 6-mile stretch of the Sugar Land rail line is facilitating the safe, timely response of emergency personnel by making them aware of approaching trains. Institute researchers in San Antonio have made recommendations on how roads — never designed for the kind of heavy use that developing the Eagle Ford Shale play has required of them — can be better built to last longer. Along a 96-mile stretch of I-35, TTI staff are assisting the Texas Department of Transportation Waco District as the department mitigates the inconveniences associated with highway construction during the massive, multi-billion dollar I-35 Expansion Project. Meanwhile, in our state capital, TTI researchers are working with local transportation planners to troubleshoot Austin’s growing traffic congestion, a problem that will only be made worse if, as predicted, the region’s population more than doubles in the next 20 years. As part of The Texas A&M University System, TTI’s mission is to serve the best interests of all Texans, wherever they live. We do that best when we work closely with those who can benefit most from the research we perform. We take our work personally because it directly affects the lives of millions of commuters, shippers and business owners in Texas and beyond. And that’s how we at TTI make the Lone Star State a better place to live, work and travel.